Oregon City Superintendent Larry Didway is in agreement with local activists who say the school district needs to do more to encourage safe and welcoming environments for students of all types. "More than anything, we're trying to see this not as an end goal but to be constantly reflecting and constantly learning," Didway said. "There's a lot of work to be done." Unite Oregon City emerged as an activist group in late 2016 in response to some students who felt empowered by the presidential election to use racial slurs not heard in the city for decades. Leaders of the group, Stephanie Cry and Tory Blackwell, praised the district's response efforts through a fairly new (as of two years ago) staff training, a board resolution affirming support for students of all types, and a May 30, 2017, town hall about the "welcome" signs at local schools. Cry and Blackwell represent two different local families, each with biracial school-age children. "This year Oregon City has done a lot of diversity work for their staff, and I'd like to think that our voices led the superintendent to put more emphasis in that area," Cry said. However, Cry and Blackwell said the district has more work to do in a couple of areas: fostering the development of diverse curriculum and increasing the diversity of leadership positions. Didway agrees. In March 2017, the Oregon City School Board voted to pass a resolution affirming the district's commitment to creating safe and welcoming environments for all students, regardless of race, gender identity, sexuality, immigration status, country of origin or other factors. The resolution says that all students are entitled to academic success regardless of background or family circumstances, and each student will be provided the necessary supports to ensure that success. Cry and Blackwell said the resolution happened to get on the school board's agenda just as Unite Oregon City congealed as a group. As the board prepared to pass what Cry saw as a "boilerplate resolution," parents' voices at the meetings forced board members to take a closer look at the language of the resolution. Didway said some of the district's equity initiatives already were in the works before the emergence of Unite OC, but he praised the role of active parents in spurring on those efforts. "Groups like Unite Oregon City — not exclusive to Unite OC, but groups like that — send a message to Oregon City that we're a welcoming place, so I think it's wonderful that we have these types of community groups," Didway said. After a town hall, "welcome" signs remained at local schools, despite concerns of some parents. Didway said the 2017 town hall fostered a broader conversation than just the signs. "That was a great night in Oregon City, and I was proud of living in this community that night," Didway said. "The takeaway was that there is a shared desire to be intentional about creating these safe and welcoming environments for kids, and that's affirming to the student who might not feel that way every day." Diversification of staff is a challenging issue, Didway said, since teachers nationwide tend to be white and female. "We want our staff to represent the full diversity of students, but that's an area that will take a lot more work," Didway said. "We've extended our reach in terms of efforts to recruit candidates, also in making affirmative statements in materials used to recruit." These affirmative statements in staff recruitment materials detail the district's promise to provide a safe and welcoming environment for staff of all ethnicities, for example. "To go deeper than that, you have to talk about pipeline and who's in the pool," Didway said. "You look at kids as early as middle school who are kids of color who are interested in education. ... We don't have a formal program like they do in some other places, and we're nowhere near doing anything like that at this point, other than looking at them and talking about that." The closest thing to a pipeline is one Hispanic student who graduated from Oregon City's bilingual program at Candy Lane/Jennings Lodge Elementary who is now a teacher at the school. Didway said another important aspect of equity in schools is for students of color to be able to relate to people in leadership positions. Currently, principals at Gardiner Middle School and Candy Lane/Jennings Lodge Elementary are Hispanic, but there are no other principals or vice-principals of color in Oregon City. Oregon City's seven-member school board is elected at large, and currently all its members are white. As far as anyone knows, there has never been a person of color on the board. 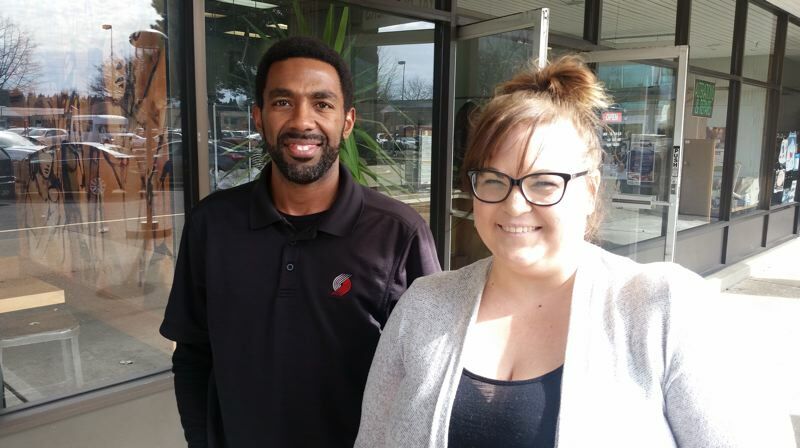 Leaders of the Unite Oregon City group were critical of the fact that the school board recently missed a chance to appoint a nonwhiteperson, but that seat and three others will soon be in voters' hands. "With each election season, there's an opportunity for the board to better reflect or more reflect the community," Didway said. "Regardless of who's on the board, we have a shared commitment to represent the whole community." Blackwell acknowledged that the racial makeup of Oregon City is changing. In 1990, about 97 percent of the city was white, but about 90 percent of Oregon City's population currently is white, according to U.S. Census estimates. "When I think about the demographic shift in the city, you need to be OK with this shift, because you're probably not going to be able to hold it back," Blackwell said. Leaders of Unite Oregon City were disturbed to see white-supremacy posters appearing in local neighborhoods after the 2016 election. They pointed out that most big companies now hire applicants from around the world. "We need to get our kids prepared to succeed in a global world," Blackwell said. Cry's daughter was a freshman on the varsity cheerleading squad at Oregon City High School when the school experienced a series of racial incidents starting in late 2016. As a result she transferred to a high school 20 minutes away, but Cry and Blackwell both have younger children attending schools in the district. "I'm happy to step in and get involved and do what I can to make sure that things will be OK," Blackwell said. Oregon City recently held its second-annual equity-focused conference for teaching staff. "Definitely we have put a greater emphasis in giving staff opportunities to engage in equity issues," Didway said. "All of this connects a lot with having ongoing professional development with your staff to make sure that their kids can see themselves in the material." Didway said various groups have formed in the past couple of years to tackle equity issues, including a parent action committee that has provided some leadership and voice for parents who don't speak English as a first language. He added that there's a new ethnic-studies course at OCHS, where the "student council has tried to put an equity lens on their role and the work that they do." Reading stories and authors that connect with the culture and origin of various types of students is important in Didway's view. Oregon has passed an ethnic study law in the last legislative session, and Didway said that the state will be sending out new educational standards that Oregon City will incorporate into instructional materials in the coming year. "For an educator, it's really about eliminating all barriers to student access regardless of their demographic qualities," Didway said. "Your ZIP code, your race, your gender or ethnic origin shouldn't predict what your academic outcome should be." Recent blackface incidents in Virginia brought to mind for school advocates the use of blackface locally as late as the mid-20th century. Racist events over the past few years in Oregon City were on their minds as they celebrated Black History Month in February, and Women's History Month in March. Cry and Blackwell said it's important for the public to understand that Oregon City's culture of minstrelsy stretched from the Civil War up through at least the late 1940s, which would be within the memory of some people who are still alive here. Several blackface photos were published in local newspapers throughout the late 19th century. One troupe performed near the location of the Oregon City Woolen Mills, where in 1886 a mob woke up more than 30 Chinese employees sleeping in their rooms, expelling them from Oregon City to Portland. A researcher in the Unite Oregon City group found that in 1949, the Oregon City Banner-Courier newspaper ran photographs of "blackfaced" performers of minstrel shows sponsored by the Canby Parent-Teacher Association. Students from Oregon City's Barclay School appeared in blackface photos, which gives a sense of how the racist culture descended from one generation to the next. Cry and Blackwell said if anyone wanted to see the photos for themselves, they can look on the microfilms at the Oregon City Library for the Banner-Courier's issue published April 21, 1949.